NEW Advanti Racing Storm S1 in 15x7, 15x8, and 15x9. Flow formed for incredible strength and lightness, a load rating of 550KG with a weight of just 12 pounds for the 15x9 size, 11 pounds for 15x8 and 10 pounds for 15x7. Colors include Matte Black, Grey AND Hyper Silver. 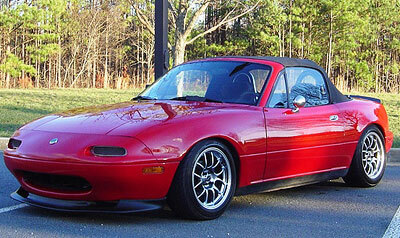 Street, Autocross and Track Performance for your Mazda Miata, MX5, MX5ND, Mazda RX8, Mazda RX7, Mazda 3, Mazda 2, Mazda 6 and CX5. 2006 Dedicated Track "NC Light"
Why Zoom with Mazda parts from Good-Win Racing? Because we race what we sell, and we share our expertise with you! When our competition goes home for the weekend, we go racing and driving in our Mazda! Using the Mazda parts we sell, under both street performance and race conditions, gives us a unique experience on what works, and what doesn't. From shock absorbers, replacement convertible tops, and shift knobs, to exhausts, intakes, springs, and alloy wheels, we can help you select the right combination of Mazda parts. You can also join our Mazda Forums for more information about specific parts and cars, as well as development of our current project cars. And don't miss our forum wheel gallery to see what those wheels you are considering actually look like on your Mazda before you buy. Quarterly Tech Days at 696 Naples Street, Chula Vista. Food, Fun, Installs! Check the forum for more information. 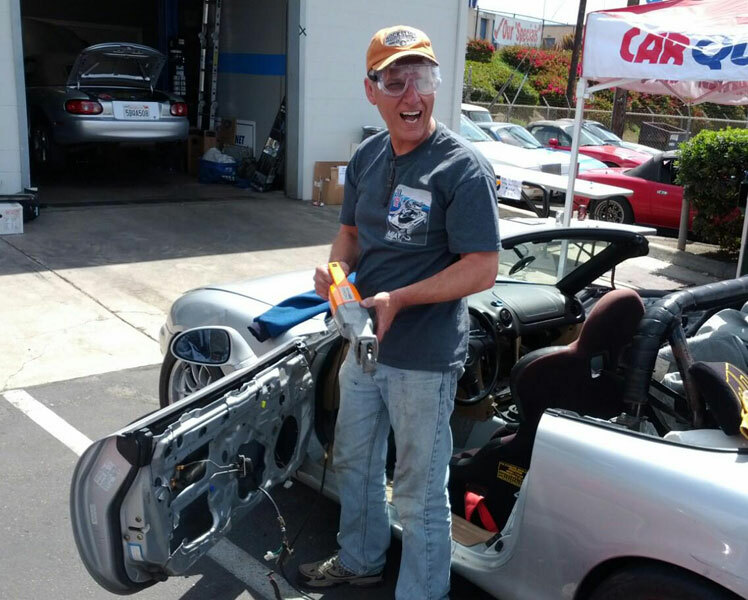 Local Miata racer Howard K. put on the weight reduction clinic at our first Tech Day. Just give our Mazda parts experts a call at 858-775-2810 or drop us an email from the Contact Us page. Looking for a source of spare used parts for my recent purchased NC. North San Diego Co or Temecula would be my preference.Thanks. I found info about adjusting spring hight for this. I got it to about 75lb heavier on driver side w/ me in car. Have yet to try it. If we use your video on the site, we will give you a $20 dollar gift certificate toward your next purchase. Include full product name and link to GWR website in video description. Contact us with the link.